Ain’t no party like a Veggie Party! Real Food. Real Deals. stopped by to share her Oven Roasted Tomatoes. I think she must’ve known that I had just been talking about trying to make my own sun dried tomatoes. I have so many tomatoes from my garden right now. And, the tomatoes at the farmer’s markets have been so beautiful! I used 2 huge heirloom tomatoes from the market, and added in about 6 regular sized tomatoes from my garden. The basil came from my garden, and again, it’s the small leaf basil that I’ve been loving! No chopping! I left the chopped tomatoes in the oven for 3 hours. I decided that I wanted my sun-dried tomatoes on the moist side. So, if you really want them well dried, for this size tomato, you’ll want them in the oven probably closer to 5 hours. But, I LOVE the way they came out. Chewy, full of concentrated flavor, beautiful color! Just LOVE them. Anyone can make their own sun-dried tomatoes; it just takes a little time. And, these are so much cheaper than store-bought sun dried tomatoes . This pasta is great served hot. But also give it a try cold, as pasta salad. It’ll be a hit at your next potluck or picnic! And, no mayo in this pasta salad! This Pasta is just one idea to use your homemade sun-dried tomatoes. I had a bunch of sun-dried tomatoes leftover after making the pesto that I put in the freezer. I think they will be delicious on a homemade pizza or with some roasted broccoli. Since they have that beautiful chewy texture, they make a great substitute for meat in meatless dishes. Oh, or they could be made into a vinaigrette dressing. There’s just so many ways to use them, and now that I can make my own, I bet we will try more and more. 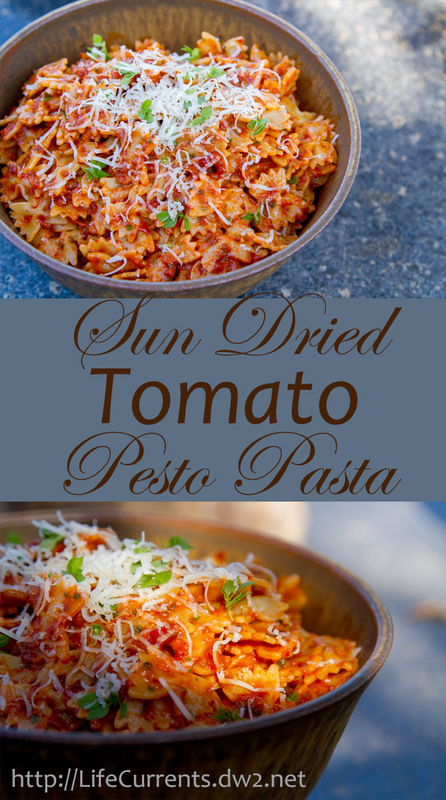 The homemade sun-dried tomato recipe is under the pasta recipe card. Just keep going. Cook pasta according to package directions. Once al dente, drain. Meanwhile, while pasta is cooking, in the bowl of a food processor, add tomatoes. Process to a fine paste. Add basil and pulse to combine. Add vinegar, salt, and pepper and pulse to combine. With the machine running, slowly pour in olive oil. Taste for seasoning adding more salt and pepper as necessary. Toss pasta with sun dried tomato pesto, and grate fresh Parmesan over the top. Garnish with additional black pepper and basil leaves as desired. I roasted these tomatoes for 3 hours. I decided that I wanted my sun dried tomatoes on the moist side. So, if you really want them well dried, for this size tomato, you’ll want them in the oven probably closer to 5 hours. If the tomatoes are small (e.g. grape, cherry, Roma), cut them in half. If they are larger, cut them in quarters. And, if they’re grande heirloom tomatoes, cut them in sixths. Roast the tomatoes until they are dry. The small ones will take 2 or 3 hours, while the large ones will take 5 or more hours. Refrigerate and use within 3 days, or freeze for up to 6 months. Adapted from Real Food. Real Deals. This looks so yummy! We weren’t lucky enough to get any tomatoes, but our basil seems to be growing and happy, so I’m definitely going to try this. This looks awesome! I love the taste of roasted tomatoes! I can’t wait to try this! Thank you so much for linking up to Wake Up Wednesdays! Pinning! Debi, this looks absolutely divine! I can’t wait to try roasting my own tomatoes and trying this pasta recipe. Pinned! Oh, Debi! This looks just so sensational (yeah – those gorgeous photos don’t hurt!). I adore making oven-roasted tomatoes but rarely get around to letting them stay in there long enough to get “dried.” Now I guess I’m gonna have to – gotta try this recipe ASAP! In fact, I wish I was eating it this very moment! Pinning now to share with our followers and fans, too! Mmmmm SUCH a gorgeous post with beautious photos!! That pasta and homemade sundried tomatoes look to diiiie for!